Funtasia 2006 At Ocean Park is an event that took place on 31-Dec-2005 in Hyderabad. Find out your fun quotient at Ocean Park! This New Year celebraed with the biggest stars and wackiest DJs, at the Ocean Park. The amusemet park is all set to take you on a high ride of fun this new year eve. For a donar pass of Rs. 499 (single), or Rs. 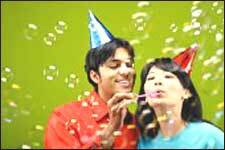 799 (couple), you can enjoy the company of actors Karuna and Anu Radhika, and celebrate with DJs Nikhil and Agnelo. You also get complementary drinks and snacks while you wait for the new year to arrive. Ocean Park has added attractions like Lucky Draws, Fireworks, Face Painting and Tattoo Artists on the premises. So rush to collect your passes and make it in time to the party of the year. Please contact 98666-99475, 93948-43543, 93993-44999 for further details. Be the first to comment on Funtasia 2006 At Ocean Park! Just use the simple form below. fullhyd.com has 700,000+ monthly visits. Tell Hyderabad what you feel about Funtasia 2006 At Ocean Park!